LinkedIn is the largest social media site dedicated for business. It boasts over 500 million members (as of this writing) with the highest per capita household income, bordering on $110,000 (can not find the source for this claim). About 100 million of its members are in the United States and all of the top Fortune 500 companies are represented. The platform is filled with top decision makers from across the country and globe. I’ve written many, many posts about LinkedIn which you can search for or select from the categories list on the right sidebar. I decided to dedicate this page, and now children pages, to further exploring this platform for help expanding your business. I am high on LinkedIn for job search and tutor and coach small business owners and managers as well as job seekers how to use LinkedIn to market either their businesses or themselves. LinkedIn is not just for looking for a job. It can provide many, many ways to expand and increase your business through networking and target marketing. I did presentations for SCORE Chicago, various chambers of commerce, banks as well as libraries. In the past I also presented on LinkedIn for MeetUp groups, the Buffalo Grove and Wheeling Park Districts, Indian Trails Public Library (hands on), as well as other libraries. I have a “questions” page for convenience for attendees of my presentations and have add “resources” pages over time. Feel free to use the LinkedIn Questions page to add comments as well. I will respond to if appropriate, or trash if not. I will publish the questions and answers on the LinkedIn Questions page. LinkedIn is evolving regularly and adding enhanced features and search options. Learn more on the since published additional pages. What do you want to be found for on LinkedIn? For instance, right now I am positioning myself as a LinkedIn Specialist. I enjoy teaching people the ins and outs of LinkedIn. I have taught adults all of my adult life since I became a manager at the age of 23. So I emphasize the word ‘LinkedIn’ throughout my profile. I am literally targeting people who want to learn more about LinkedIn. So if someone searches for “LinkedIn Specialist” my profile comes up in results. At one point in time I ranked (non-personalized search) number 1 in over 9 million search results for “LinkedIn Profile Evaluation”. 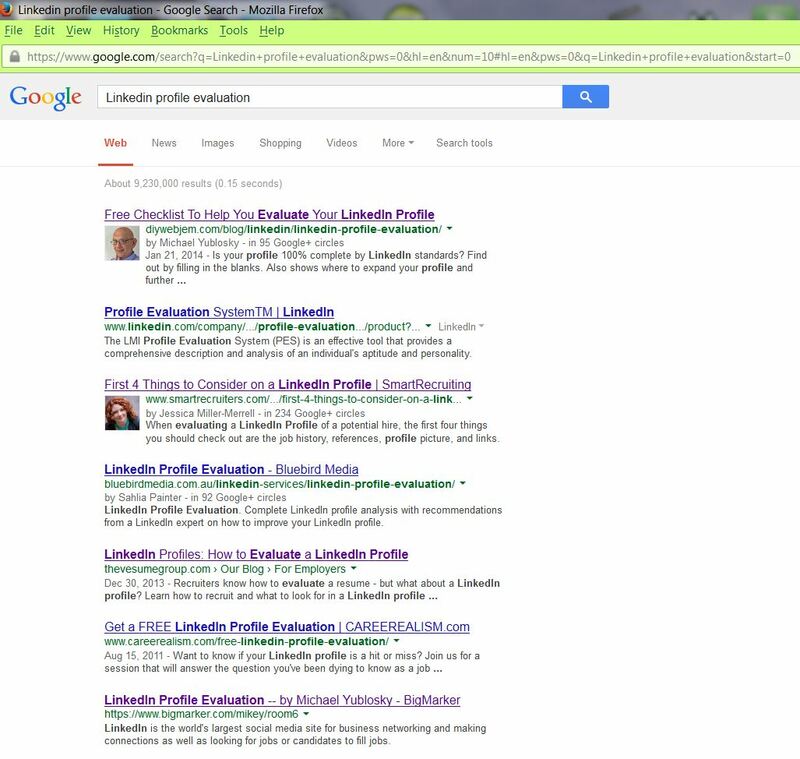 Shucks, I even outranked LinkedIn (number 2). It is somewhat complicated to set up an effective marketing plan and it is personal, based on your goals, your ambitions and your dedication to seeing it through. As I say in my presentations: “Someone has to do the grunt work!” There are many aspects to consider including competitive research, branding, target marketing, keywords, etc. Let us for sake of time assume your plan is in place, as are your tactics and strategies. Then you can proceed with the implementation! Completing your LinkedIn profile is Step number one.